Peter Lombard (born in Lombardy), was a student and then teacher in Paris, where he became archbishop shortly before his death in 1160. He wrote a number of commentaries and theological works in the 1140s-1150s, including this commentary of the New Testament letters of St. Paul, which became a standard text throughout the rest of the Middle Ages. The text and commentary are arranged as follows. The first large initial 'P' introduces verse 1 of the text: the biblical text is written in red ink. The smaller illuminated initial 'P' introduces Peter Lombard's commentary, written in ordinary brown ink. Each word from the biblical text when quoted in the commentary is underlined in red, allowing for quick and convenient cross-referring. 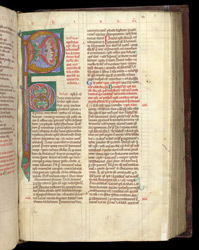 Other aids to the reader include the medieval foliation ('122') and chapter number ('1') in the top right corner.